Spring Hill High Senior Bella Price got involved in suicide prevention efforts after losing a good friend. 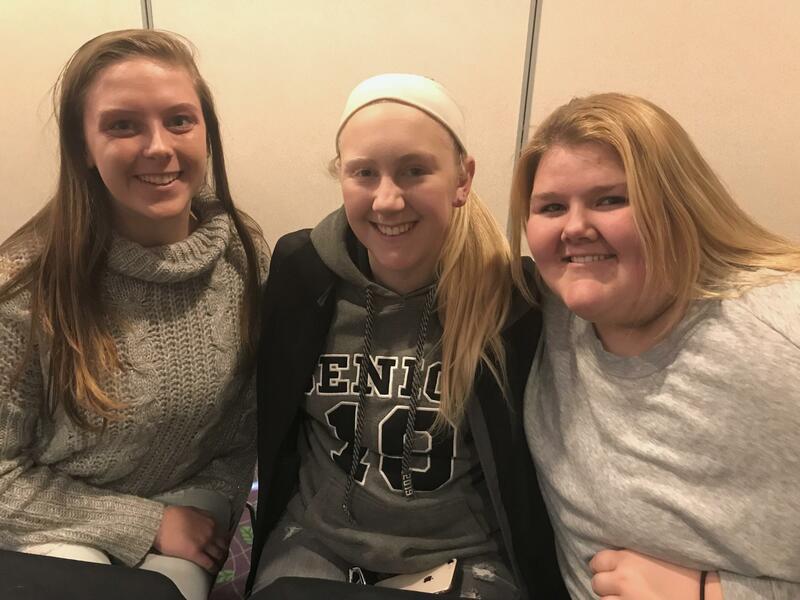 Now, she's among a group of students from Johnson County, Kansas, who are helping shape new suicide prevention programs aimed at addressing a spike in teen suicides in the county. The trend is even higher across the state line in Jackson County, Missouri. Both mirror what’s happening across the country. Suicides among young people have increased by 56 percent between 1999 and 2017. Families, friends, school and health officials are all trying to make sense of the rise. Allie Doss lost her daughter to suicide. Now she finds comfort being in Sara's room. Allie Doss has kept her daughter Sara Prideaux’s room just as she left it after her summer in Spain a few years ago. The purse and camera she took abroad are stilll hanging on the closet doorknob. Sara’s favorite stuffed animals are squished in a net over her bed. “I’m sure they’re dusty, but no one is allowed to touch them,” says the 37-year-old mom. She sits on Sara’s double bed. Sara's favorite brightly colored comforter still covers sheets Doss washes and changes regularly. It’s been three years since Sara took her life at age 16. She was about to be a junior at Shawnee Mission West in Johnson County. “So the first year after she passed I would come in here and just lose it and be angry and resentful and sad,” Doss says. She still feels like her daughter’s choice was the ultimate act of rejection, like she'd been a bad mom. She believes people still judge her when she talks about the tragedy. Must have been problems at home. Drugs. Bad parenting. Today, she finds some relief from the relentless grief and guilt when she comes into Sara’s bedroom. Almost immediately after Sara’s death, Doss teamed up with Drs. Karen and Steve Arkin, who’d lost their son Jason to suicide the same year. They founded Speak Up, a community agency aimed at destigmatizing mental health and suicide. The goal? To empower kids to take the first step in supporting each other in their mental wellness journey, according to Doss. She's haunted by why Sara didn’t share her struggle. High school officials in Johnson County are plagued by the same questions. The suicide rate among 18-year-olds over the last seven years has risen 65 percent. Every school district in Johnson County has had at least one suicide in recent years. Some have had two. In just one calendar year between the spring of 2017 and 2018, Blue Valley had five. Superintendent Todd White said enough was enough. White says in the past, schools have tip-toed around the issue of suicide, and discouraged the outpouring of sympathy that happens when a student dies from a car accident or cancer. That needed to change. White decided it was time to take a different approach. It suddenly seemed obvious; ask the students what they thought was going on. “It was adults, trying to identify and figure out what kids needed,” he says. White and the other five district superintendents in Johnson County began meeting monthly with mental health professionals, law enforcement, families, doctors and faith leaders. They teamed up with programs like Speak Up and other prevention efforts. Some schools committed to mental health exams at the start of the year. They brought in experts to train kids on how to identify warning signs in peers, and when to alert a trusted adult that a young person might be at risk. Consultants came in and created a teen council and a prevention campaign dubbed #zeroreasonswhy. Eighteen-year-old Bella Price joined as a way to prevent others from feeling as alone as she imagines her friend Josh Hoston did. Another classmate took his life a year later, shattering the small community. Brianna, left, survived a suicide attempt and is now working with peers on prevention programs. 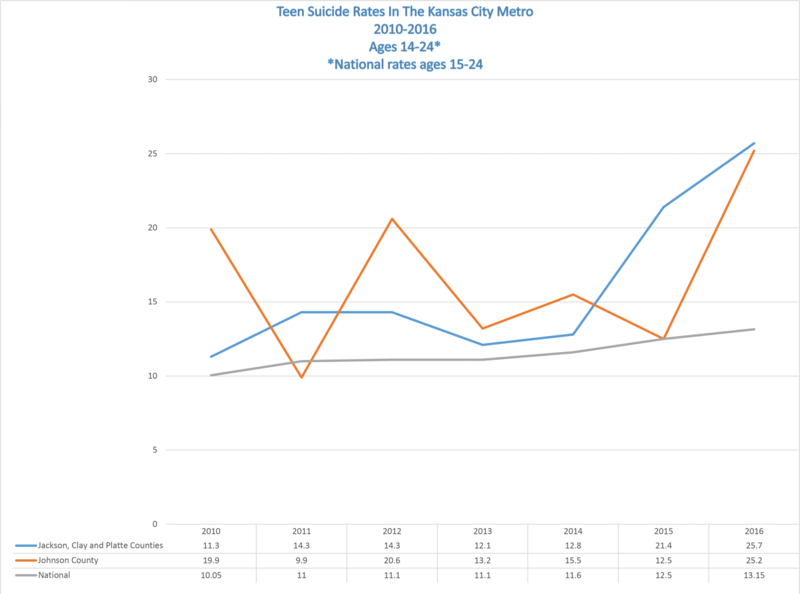 Teen suicide rates are even higher on the Missouri side of the metro. Brianna is a senior in the Lee's Summit school district. (We're using only her first name because of her age and the sensitivity of the subject.) The summer before her sophomore year, she attempted suicide. She never talked about her depression with her family. “My family has anxiety problems, and they’re kind of ‘old school,’ so I kind of feel like it would just freak them out,” she says. Today, she says she wishes she’d opened up to them. Brianna knew two students who took their lives last fall at Lee’s Summit North within two weeks of one another. She’s now gotten involved in Lee’s Summit Cares, a community organization that’s recently added suicide prevention to its work in bullying and substance abuse. She’s helping establish a task force on youth mental health and wellness. It’s difficult to get exact numbers on suicides among young people, but the Centers for Disease Control and Prevention indicate between 1999 and 2017, suicide rates for women between 15 and 24 jumped from 3.0 to 5.8 per 100,000. For men, it was significantly higher: from 16.8 to 22.7 per 100,000. It’s now the number-two cause of death for 15-to-24 year olds. He says there’s typically an underlying mental health issue, but it’s complicated. Schools and communities are doing the right thing to crack the culture of secrecy. “It sounds weird to say we want to talk about suicide all the time,” Ackerman says. “But that is healthy, (and) absolutely a child is less at risk if they don’t feel like it’s a shut door." Experts say we'll never end teen suicide completely. But by removing the stigma around mental health, providing resources and most important, a space for young people to talk about the pressures of being a teenager, the hope is fewer of them will see suicide as their only way out.